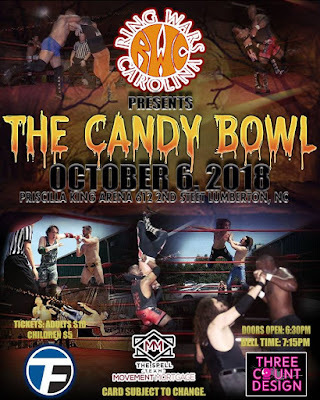 Ring Wars Carolina: Event Results: "Candy Bowl 2018"
*Simply Delicious Dino, as winner got to choose to wrestle for a championship of his choice. SDD chose to wrestle for the RWC Heavyweight championship. Nite-Stic Eddie Brown confronted SDD and the match was made for Nov. 3, 2018 at "HomeComing 2018" in Priscilla King Arena located in Lumberton NC!! !